The official data being collected for the National League, which had for years been at the same level as the EFL, was cut back significantly (presumably for cost reasons). To me this feels like a huge backward step that they’ll ultimately regret, but (that aside) it also broke the model, which needed that data to establish a starting rating for newly-promoted clubs from that division. I wanted to make the model better, having read a slew of interesting posts over the summer about approaches that could potentially improve it, so I took it to pieces and started to rebuild it from the ground up. However towards the end of the summer my team at work won some additional contracts that soaked up most of my free time, so I kept having to park it. I’ve still not gotten around to addressing (2), which is a huge job and needs a stretch of unbroken time (and lots of testing) devoted to it, but I was starting to get sick of not having the ratings around so I’ve slapped the old model back together and come up with a quick fix for (1) – basically using actual goals instead of expected goals to feed the ratings – which will have to do for now. 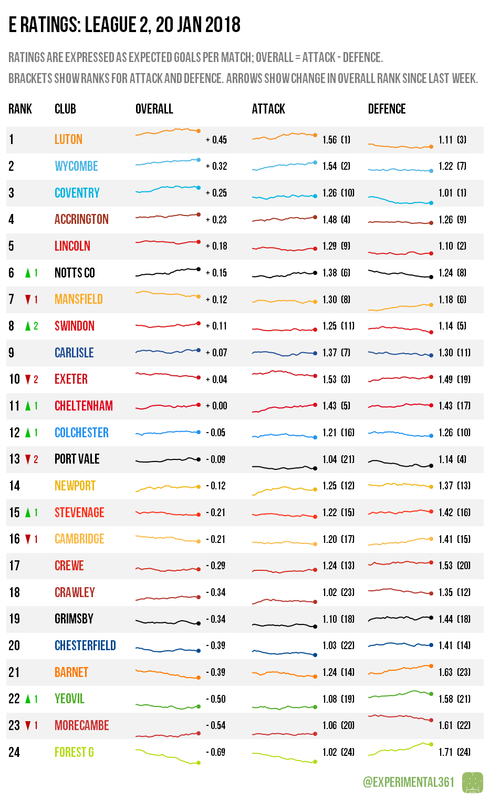 The graphic below lists each club in descending order of their overall E Rating and shows how this – along with their individual attack and defence ratings – has changed over the past 30 league matches. The red and green arrows indicate how the overall rankings have moved in the past month and the numbers in brackets show the ranks for each team’s attack and defence ratings. Luton‘s performances have been ebbing slightly of late but they’re still the best-looking side in the division overall. Wycombe‘s ratings are improving steadily and they actually look to be more or less the Hatters’ equal in attack, albeit less so in defence. For Coventry and Lincoln it’s the attack that could potentially do with some improvement if they’re to sustain their promotion challenges: defensively both are already impressive. Despite their big win over Cambridge, Forest Green need a few more positive performances to shake off the mantle of worst-rated team. Their ratings have levelled off recently and, along with those of Yeovil and Morecambe, could be on the up, while Barnet have been on a downward trajectory lately thanks mainly to their defence. Luton remain overwhelming favourites for promotion, with four clubs currently scrapping it out for the other two automatic slots. 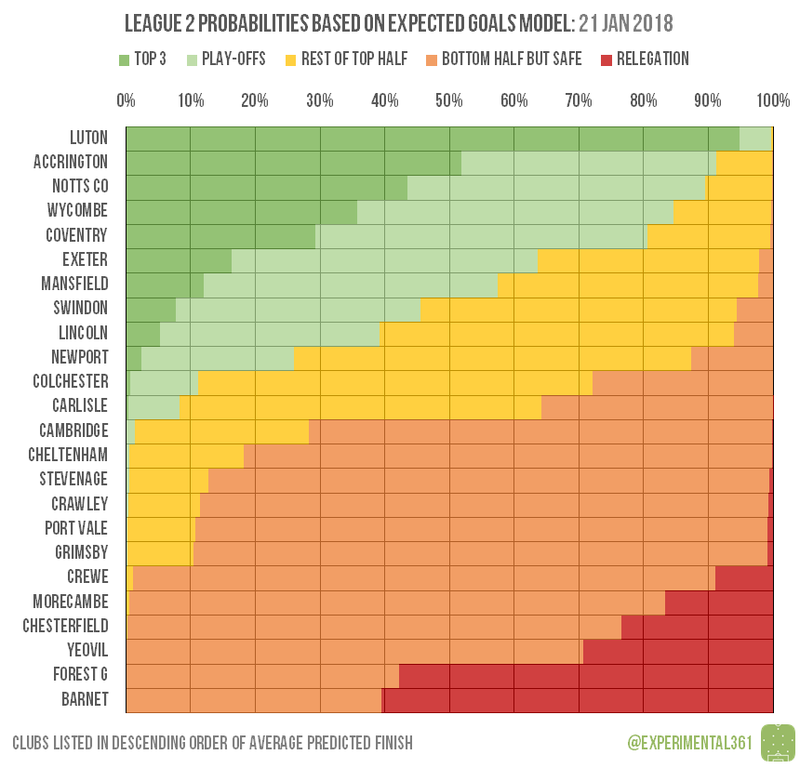 Accrington and Notts County appear likeliest to prevail at the moment, but Wycombe and Coventry aren’t far behind. At the bottom, Forest Green and Barnet are currently out on their own as candidates for the drop, with both considered marginally likelier to be relegated than survive. There’s still plenty of time though, and a clutch of teams around them are still not out of the woods.